US Markets are closed on Monday and Market Insights comes in an abbreviated version this week. Wishing everyone a wonderful Labor Day Week-end! Gold traders pushed the precious metal to the highest level since February of this year. The magic $1,000 barrier is within arm's length and the previous high of year at $1,007.70 may be tested again. We talked about issues of regulatory failures at length, most recently in Market Insights 15 August 2009. The US Securities and Exchange Commission just published a 477 page document detailing how the regulator failed to uncover and prevent the largest financial fraud in history. The official document is entitled: Investigation of Failure of the SEC to Uncover Bernard Madoff’s Ponzi Scheme-Public Version (click on link to download or email us for a copy). Not having read the document yet, some of the excerpts of the Financial Times article SEC closed Madoff ‘fishing expedition’ are chilling reminders of how regulators failed in their very basic function. Now that this 477 page long admission of guilt is out in public, several concerns come to mind. a) Ignorance as an acceptable defense cannot and should not be tolerated, certainly not for towards the experts we rely upon to regulate the financial system. b) Officials at the highest level must be held accountable; how else could a culture of mediocrity, limited experience and "communication problems" change? c) What are the steps taken by the agency to prevent similar failures? As reported above, Deutsche Bank declared this week that it will discontinue its Double Long Exchange Traded Notes (ticker symbol DXO) and would redeem all outstanding shares of this Leveraged Oil ETN. In our ongoing quest to shed some light on ETF's, numerous articles were quoted; most recently more financial institutions expressed concerns particularly about the leveraged ETFs - see: Leveraged and Inverse ETFs: Not Right for Everyone. These previous newsletters may also be helpful as a reference: Market Insights 6 June 2009 and Market Insights 22 August 2009. Please also consider: Why Did Deutsche Bank Drop DXO? an easy to read article giving three main reasons as to why this ETN was discontinued. (1) Regulatory Heat: The ETN has had so much interest from investors that the fund itself is now above the position limits imposed by the futures exchange NYMEX. The fund itself simply cannot take on more positions making it incapable of effectively matching the oil price. (2) Litigation Threat: Because of the many retail investors who may have had a naïve expectation (see Market Insights 22 August 2009) that this ETN, along with other leveraged ETFs, would perfectly match the returns of the oil price over a longer period of time, as supposed to matching only the daily returns, law suits from disillusioned investors are for sure to come next. By terminating this ETN early, the bank may mitigate some potential future damage. (3) DXO Makes Little Money: Despite the size of the fund and some substantial demand both from institutions as well as from retail investors, the fund issuer didn't make enough money on it. In summary, let us look at a graphical reminder as to why leveraged ETFs and ETNs like DXO are not a good deal for retail investors. Leveraged ETFs are simply imperfect instruments to mirror the performance of the underlying asset over a longer period of time. As a double long fund, the DXO is only about 5% above the oil price (year-to-date) when the naïve expectation would expect twice the returns. 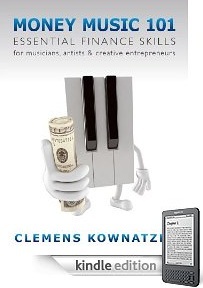 And as such, it is a rather costly instrument too. The expense ratio of DXO is 0.75%. The US Dollar continues to be under pressure but it stabilized somewhat against the Euro recently, trading between 1.4000 and 1.4400 in the past few months. The US$ Index shows somewhat of a rising support line (lower blue line) within the underlying down-trend (upper blue line) remaining above 78 at the moment. We may see a new trend forming as soon as next week, when most traders return from their vacations. Keep an eye on new developments to see if a new trend emerges. Japanese Yen also made some head way touching 92.00 against the US$ this week, the strongest it has been in 2 months. The bigger news however came from Down Under. The Australian Dollar approached a new high for the year closing the week just above 0.85. The currency is now up over 21% for the year and gained back 36% against the US$ since the beginning of February. This comes on the back of news that Australia's economy grew by 0.6% in the second quarter of 2009. The Australian Dollar is considered a commodity currency and, as a natural resource rich country, Australia has profited from the price increases in some commodities, particularly minerals and metals. With ongoing high demand from major producers like China, this trend may continue for some time. There are some technical factors making the case for a strong Australian currency as well. 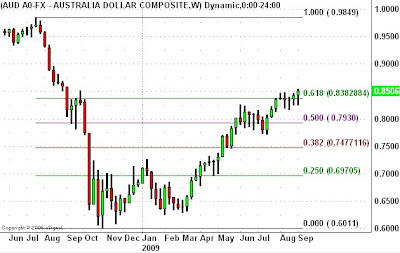 Since its massive decline against the US$ during 2008, the "Aussie" gained back considerable strength and has recently traded above the 61.8% Fibonacci retracement levels. Technically, an indication that the trend will continue higher. Confirmation of this upward trend would be given by a break of the resistance level just above 0.85 as indicated by the formation of a double-top pattern on the chart below. If the Australian $ cannot break above that level, look for some retracements towards 0.8000. Any price above 0.8 (0.7930) would give rise to another attempt at breaking on the upside.